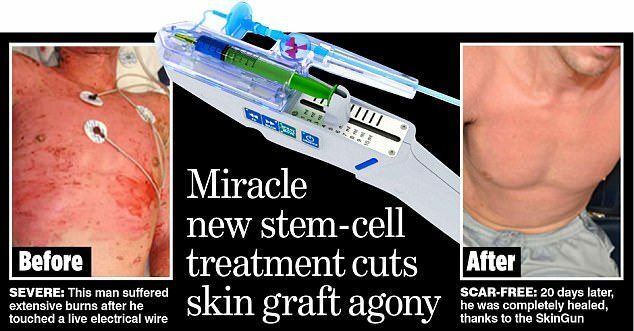 Burns victims are making incredible recoveries thanks to a revolutionary ‘gun’ that sprays stem cells on to their wounds, enabling them to rapidly grow new skin. People who suffer extensive burns usually have to endure weeks or even months of treatment, with surgeons taking large sheets of skin from elsewhere on the body and grafting them. The process is painful, and patients are often left with permanent, unsightly scars. Now, US doctors are using a new technique that allows patients to regrow a new layer of healthy skin in as little as four days. Patients who have benefited say their new skin is virtually indistinguishable from that on the rest of the body. First, a small patch of healthy skin the size of a postage stamp is removed. The stem cells are then separated out and put into a solution that is sprayed on to the wound. The process takes just 90 minutes. In one case, a 43-year-old man sustained an extensive hot-water scald to his left shoulder and upper arm, so bad that it left him with huge raised welts. 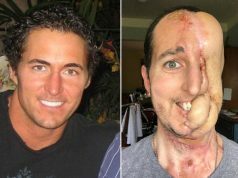 He was sprayed with 17 million cells and within six days new skin had formed over the whole wound and he was discharged from hospital. 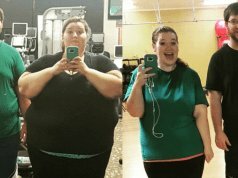 Within six weeks he had recovered full range of motion. 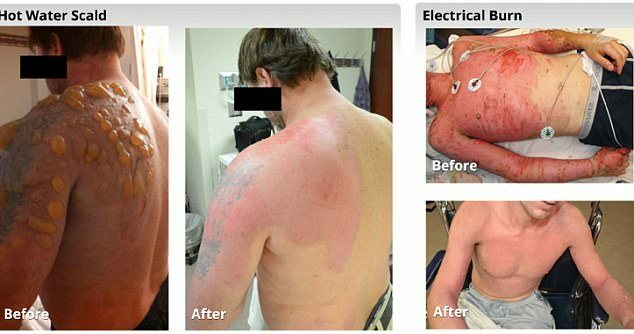 In another case, a 35-year-old man suffered electrical burns to more than a third of his body after touching a live wire. Doctors harvested nearly 24 million stem cells from an area smaller than an iPhone 5, and sprayed them back on to his body. After four days, a thin layer of skin had regrown over his arms and chest, areas which had suffered the least deep burns. After 20 days, ‘all of the areas treated with cell spray grafting were noted as completely healed’. Mr Bold explained that, in normal circumstances, wounds heal from the outside in, with healthy skin on the edges supplying the stem cells needed for the repair process. Plastic surgeons assist by taking skin grafts and puncturing them with many holes. This they lay on the wound. The holes cover over with skin, creating a new layer. In this way, wounds up to six times the area of the donor skin can be healed, but the process is slow and prone to scarring. By contrast, Mr Bold said, the SkinGun meant that new skin could form evenly across the whole wound from day one. More than 60 patients have now been treated with the SkinGun. RenovaCare is applying to the US Food and Drug Administration for permission to use it in routine clinical practice. It will then look to obtain a similar licence in Europe. Stem-cell methods helped cut this risk by quickening healing and providing a source of new skin from a very small area.